about an idea that has now become real. and the potential it brings. This is one such technology. And we just love that it's all about brainwaves! Take your meditation and yoga practice to the next level with Muse: the brain sensing headband. Muse is a tool to enhance your wellness by helping you to train your brain. It’s designed to build on the healthy body and mind you are already working on by providing you with real-time feedback during daily guided training sessions as short as 3 minutes a day, any time any where. Reduce stress, focus the mind and boost concentration. Do you feel like you just can’t “shut off” your thoughts? Muse can help by guiding you through a series of focused-attention exercises with the Calm app, while providing you with real-time feedback to help you understand how well you are maintaining your focus. Improving this skill will help you reduce anxiety and stress, focus the mind, boost concentration and productivity, and increase your composure in stressful times. Your brain generates constant electrical impulses when you’re thinking, sleeping or even relaxing. These impulses can be detected from outside your head. 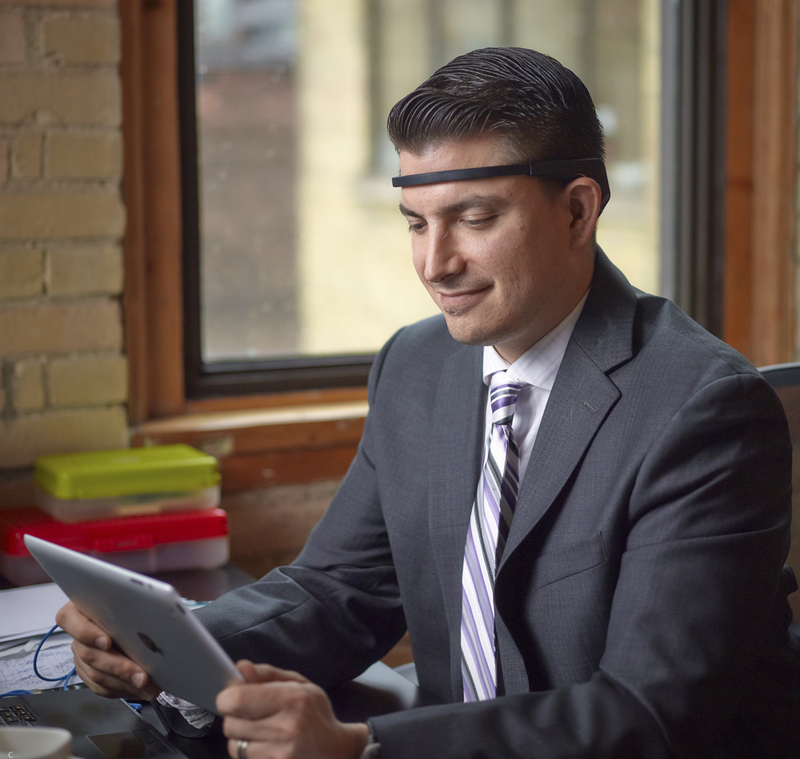 Muse uses brain sensing technology that doctors and scientists have employed for more than a century. This technology allows Muse to detect your brain signals from outside your body the same way a heart monitor measures your pulse. Muse then gives you a steady flow of feedback on your smartphone or tablet using Bluetooth. Pair your device to Muse via Bluetooth; you only have to do this once. Download and launch the Calm App (Available on the Amazon Appstore, Kindle App Store, Apple App Store or Google Play Store). The orientation video will help you fit your Muse to get the best results. Close your eyes and listen to Muse guide you through a peaceful focused-attention session. As you do the exercises you hear the sounds of the beach with waves lapping on the sand and an ocean breeze blowing. This sound reflects the state of your brain from moment to moment. If the sounds are peaceful and quiet then your mind is calm and focused. If the sounds are louder and more intense then your mind is wandering and distracted. Learn to keep the winds calm and you are learning to keep your mind calm. After each session, open your eyes and see the results on your device’s screen. You can see your session results as well as previous results so you can track your progress. What's Included when you Buy Muse? A Muse: the brain sensing headband, a micro-USB charging cable and a Quick Start Guide. The free companion app, Calm, can be downloaded from the Amazon Appstore, Kindle App Store, Apple App Store or the Google Play Store. The scientific evidence is clear on the benefits of building a focused-attention practice: reducing stress, increasing focus and improving heart health. It’s like an exercise routine for your brain. and hard carrying case (where selected for bundled purchase). Please use your preferred email address that will be used for sending your invoice and payment instructions. Please confirm the number of units being ordered. Any instructions you may have for us. Please enter NA if none required.